Fortimedix Surgical is a fast growing medical device company with the ambition to inspire a new wave of technological advancement in the field of minimally invasive surgery. The company is headquartered in Nuth, The Netherlands, and has a US subsidiary in San Diego, CA. With a strong history as a global market leader in contract stent manufacturing, Fortimedix has been a trusted partner in the medical device industry for almost two decades. Read more about Fortimedix Surgical. "It is very exciting to be part of this new wave of technological advancement across surgical specialties.."
symphonX™ is the world’s first single-port surgery solution compatible with a standard 15mm laparoscopic trocar. 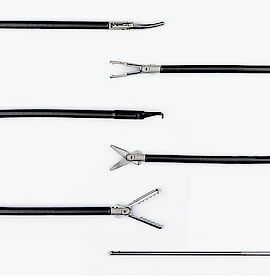 Emulating conventional, multi-port laparoscopy enables surgeons to perform procedural steps ergonomically, allowing a comfortable and secure single-port approach. symphonX™ is poised to deliver on the promise of single-port surgery, including fewer port-site complications, less post-operative pain, exceptional cosmesis, elevating the standard of care in laparoscopy. Read more about symphonX™. Successful cadaver study by Dr. Patricia Sylla & Dr. Karl-Hermann Fuchs confirms readiness for a 2nd human case series of the Fortimedix Transanal Colon Resection (TaCR) platform.